A.P.T. 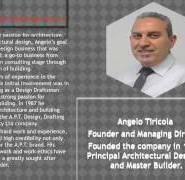 Design, Drafting & Construction Pty. Ltd. :-Building Designers MelbourneAt A.P.T. Design, Drafting & Construction Pty Ltd, we like to consider ourselves a one-stop-shop for all things building design. The process of design and building can be daunting for some and we are here to make the ride as smooth and stress-free as possible for our clients.